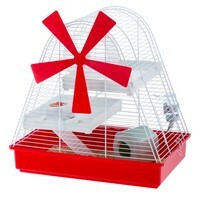 Magic Mill Hamster Cage has been designed to attract the attention of your children and teach them how to care for animals, whilst providing your pet with a safe and stimulating habitat. With large blades that are connected to the wheel and a wide base that rises and narrows like a real windmill, the cage also features several levels that are connected by ladders and divides the internal space into various areas for different times of the day. Made from a coated solid metal mesh and durable plastic, the Magic Mill also comes complete with a set of accessories including a Wheel, a Food Dish, a Drinking Bottle, and a House. The cage has a side opening for daily maintenance, and the various levels can be removed when needed. When it’s time for a more thorough cleaning, the mesh can be easily detached from the base completely.